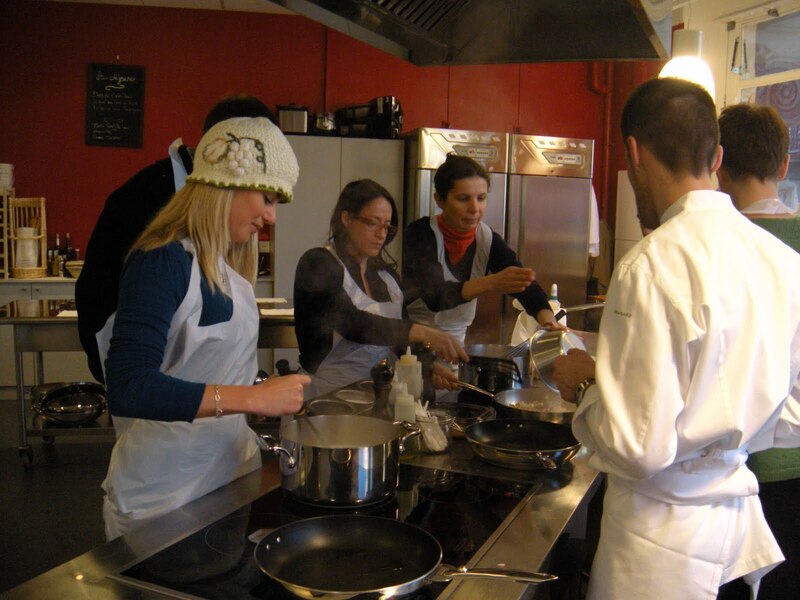 Traveling back to Paris meant I’d have time for two more cooking classes…on the same day. 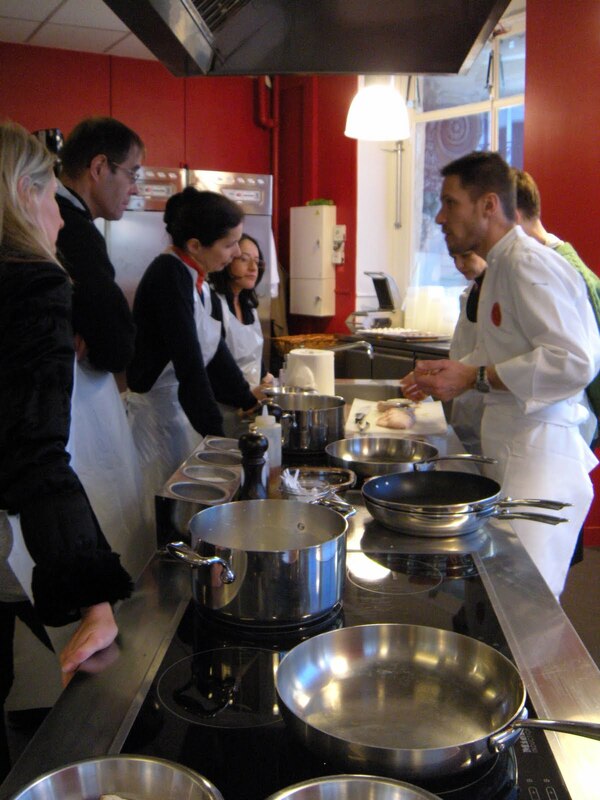 Ally and I participated in what I consider to be one of the best values in Paris today at Ateliers Des Chefs. There are six locations scattered about the city, and for €15, we cooked our way through a quick (30-minute) lunch menu in a rather chic demonstration kitchen at the BHV on Rivoli near Hotel de Ville. There were only seven us in the class, which meant it was pretty hands-on, and easy to take notes and follow along, especially since the classes are conducted in French. 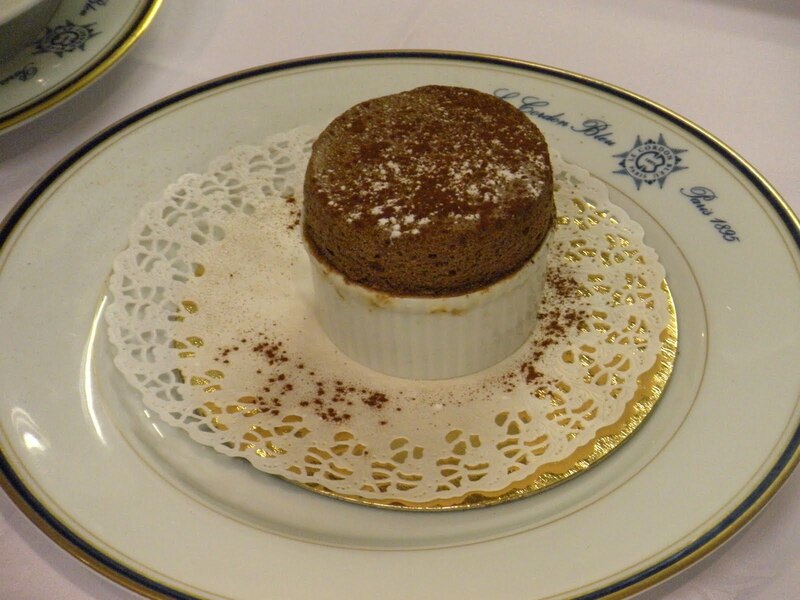 This menu was as easy as it sounds, and if you can understand French, these classes are a huge bargain. The menu was simple and truly done in 30 minutes (where were you on this one, Rachel Ray? ), and the food wonderful when we sat down to lunch with the rest of our class. 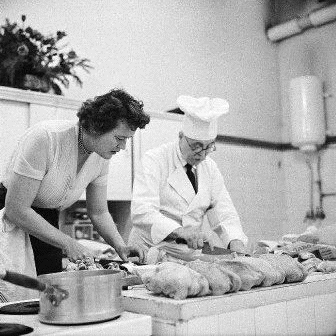 In the evening, Ally, Leila and I moved from one side of Paris to the 15th, home to the colorfully named culinary school, Le Cordon Bleu. It’s on a pretty residential side street, and if you weren’t looking for it, you’ll probably walk right past. In our second class of the day, however, we would get very familiar with butter, heavy cream, and milk on repeat in some version of that order. This was An evening In Honor of Julia Child. 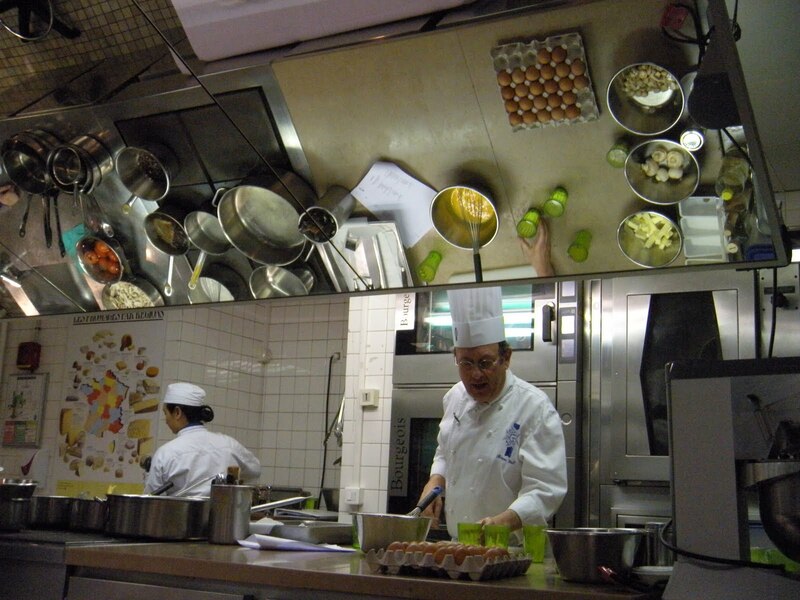 Entirely demonstration-based, the class at Le Cordon Bleu was three hours long. Chef Stril spoke only in French, but a translator was on-hand to assist the mainly English-speaking audience. From there, we learned the proper way to segment a chicken into eight pieces for our chicken with tarragon sauce. Chef made quick work of removing the spine, and at dinner after (I should mention this class only resulted in Barbie-sized tasting plates..and wine…there was wine…), we all agreed that this was a skill definitely developed over time. And this dish took time. He browned the chicken, then removed it, then used the chicken fat that had rendered off as the base for the sauce. We learned the right (and easy) method to peel a tomato, and then watched as two assistants diced them into uniform pieces for the Chef. 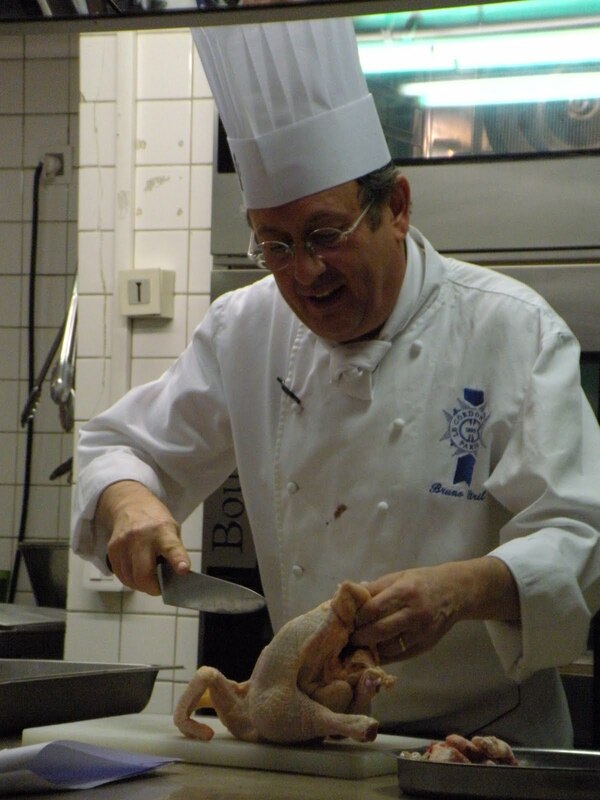 He told us how there is always veal stock bubbling away in the Le Cordon Bleu kitchen downstairs because it’s involved in so many of their preparations; that went into the dish too. And we learned how to make a pot lid from parchment paper, which put our dish out of sight and mind while he worked on the scallops and potato cakes. Our next dish was quite “Republican,” as someone I know likes to say: scallops and mushrooms in a white wine béchamel-style sauce served on the half-shell. This was the star of Chef Stril’s show; we all agreed on that. 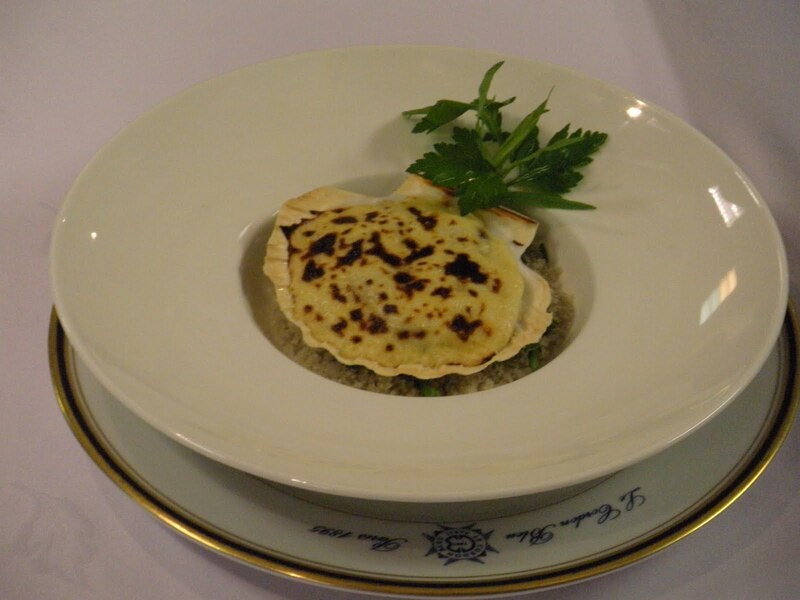 He opened up the scallop shells to access the meat, and kept the coral egg sack as part of this dish. It’s a gorgeous hue, but I didn’t have any on my plate and probably would have skipped it. After sautéing the scallops until they were only cooked part of the way through, he sliced them into 3mm disks and set them aside. He added shallots and sliced mushrooms to their pan, and then deglazed with white wine and added cream. At this point, he got started on the sauce. Butter, heavy cream, milk, and more, more, more of it all went into the sauce, and at the end, he tempered in egg yolks to help the dish brown under the salamander. The result, a feast for the eyes and mouth. A buttered shell, a scoop of the creamy mushroom mixture, sliced scallops atop, and a slather of the béchamel to cover the shell. 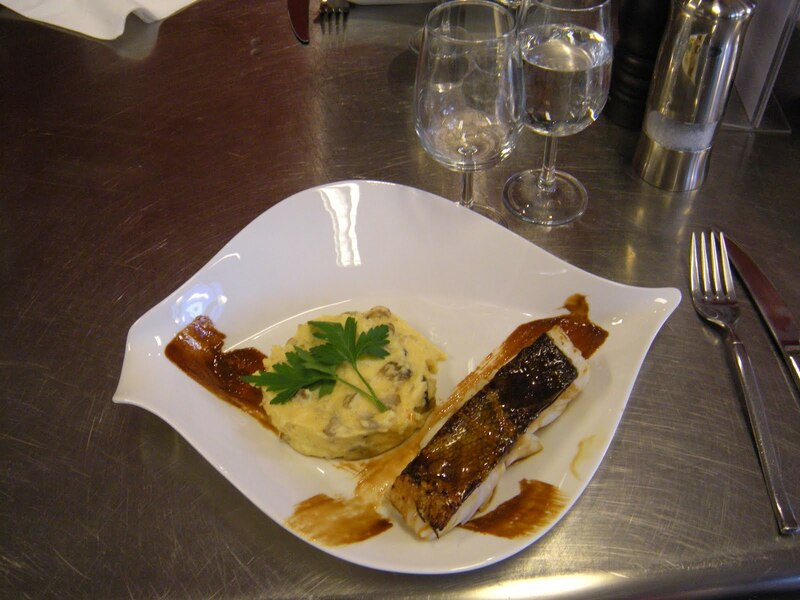 Under the salamander (a broiler would work too) for about five minutes, and Chef Stril had made somewhat quick work of the Coquilles St.-Jacques. I almost dove onto the table for the example one. It was that good. I can see why they don’t let the audience participate in a menu like this one. It took our Chef about two-and-a-half hours to get this together and he’s been doing it for 40 years. It was a great learning experience though, and since it is hands-off, anyone could participate and have fun…young, old, or food-fearing. I like, really heart you. I started a mental list of what you're going to teach me when you return.